Here you will find a list of some of the best companies and programs for teaching abroad in Asia. Included you will find some basic info about them and links to reviews and forum threads by former ESL teachers. There a A LOT of English language schools out there. The companies/language schools listed here are just some of the largest in Asia or in the world in some cases. There are very few so-called "programs" for teaching English in Asia. There are 2 large government run programs for teaching English in Eastern Asia. The JET program in Japan and the EPIK program in Korea. These two government run programs have some of the highest ratings of all the companies and programs listed here. There is a fairly new one in China called Ameson which claims to be non-profit and non-governmental. Some of these companies have hundreds of language schools found throughout China, Korea, Taiwan and/or Japan. These large companies employ many English teachers. Many of these large companies do not outsource their recruiting. You can often find a job directly through them since they often hire in-house. These large companies in China have schools throughout that are also referred to as training centers. Wall Street has over 425 branches in 28 countries around the world. You'll not only find their schools in China, but throughout Asia including Korea. Wall Street focuses on teaching adults. Their salaries for teachers ranges from 11,000-16,000+ RMB a month. Teachers teach either 30 or 21 hours with 4 or 5 office hours per week. These schools specialize in teaching children aged 2-12. They use the Disney characters throughout their materials. They have over 30 branches throughout China. Teachers work 40 hours a week and spend 21-24 hours teaching. Teachers make 10-15,000RMB a month plus a monthly accommodation stipend of 3-4,800RMB. EF is one of the biggest chains in China with branches in the 1st tier cities. It also has branches in Russia and Indonesia. Teachers can make upwards of 13,500RMB a month plus a flight reimbursement. Positions are available for teaching adults and young learners. Teachers work 40 hours a week and teach 20-25. This company has over 120 branches across China. In Shanghai they offer one of the highest salaries ranging from 14-17,500RMB a month. Teachers work 40 hours a week and teach about 25. Positions are available for teaching children or adults. DD Dragon has branches for teaching children in Taiwan and in China. On their site they offer 9,000RMB a month plus free accommodation. But I think that amount can vary from location to location. Teachers can teach up to 25 hours a week. The positions that I have applied to did not have many office hours and lesson planning was minimal. I have been to branches in Taiwan and in China. The facilities I saw looked a little smaller and not quite as shiny as some of the bigger chains. This program is new and it is also known as Ameson Education and Cultural Exchange Foundation. It is a non-profit, non-governmental organization. They claim to offer: free housing, mandarin lessons, airfare reimbursement at the end of the contract, and more. Where do you look for a job in China? Check out echinacities or Dave's. Many schools prefer to hire in country, but many of the companies below will hire first time teachers from outside of the country. Interac is a company that supplies teachers to work as an ALT (assistant language teacher) in public schools throughout Japan teaching primary, middle and high school students. They offer a salary of 230,000-250,000 Yen per month. Teachers work from around 8:30-4:30pm Mon-Fri. The JET program like Interac also supplies teachers (ALT's) to work in primary, middle, and high schools in Japan. The JET program is run by the government. Their salary starts around 3,360,000 Yen a year and goes up about 300,000 Yen per year. Their contract includes free airfare to and from Japan. Teachers work 40 hours a week. The JET program currently has a 4 star rating (Rating: 4.1 - ‎144 votes). Berlitz has a number of chain schools across Japan. They have several contracts. The starting salary for full time contract is 250,000 Yen a month for 26 teaching hours. The focus here is on teaching adults and business English. AEON is a large company in Japan with over 250 language schools. Their contract offers 25 teaching hours and 15 office hours for 270,000 Yen a month. This company is over 50 years old and has over 180 branches throughout Japan. They also offer 7 weeks of paid vacation. They have one of the better looking ratings amongst companies in Asia. Where do you look for a job in Japan? Check out this article on the best sites for jobs in Japan. Korea is a popular place for teaching English in Asia. Full time teachers here make a good salary per month, get free housing, free airfare, severance pay and a pension for some. The large companies below have schools that are referred to as hagwons. The EPIK program is a government run program that places teachers in public primary, middle and high schools in Korea. Aside from the benefits that most teachers in Korea enjoy they also offer a couple of allowances. As mentioned before this program gets good ratings. The EPIK program also currently has a 4 star rating. The TALK program is also a government run program that places teachers in primary schools. Unlike EPIK teachers teach only 15 hours a week and receive 1,500,000 Won a month. Here teachers only need to have 2 years of a degree completed or an associates. Pagoda is a large company in Korea with language schools in multiple locations. It focuses on teaching adults. YBM is a large company in Korea with multiple branches and locations. It focuses on teaching adults. It is a subsidiary of YBM Sisa. It has another sister company called YBM ECC Plus that focuses on teaching children. CDI (Chungdahm Learning Institute) claims to have over 120 locations across Korea. Unlike most other companies in Korea they offer the option of getting paid hourly versus getting a salary with benefits. Positions are available for teaching adults or children. Where do you look for a job in Korea? In Taiwan private schools are often referred to as buxibans. HESS claims to employ more than 500 teachers across Taiwan. It is one of if not the largest English language learning companies in Taiwan. Teachers start at $NT580 an hour and they guarantee a certain number of teaching hours a week. They offer 4 days of training prior to the start of the contract. They focus on teaching kids. Shane is a large company that has branches throughout Taiwan and China. Teachers teach a maximum of 18 students per class. Their monthly salary ranges from $NT44,000-$NT70,000. Teachers teach both adults and children. Kid Castle claims to have over 200 branches across Taiwan and another 200 in China. It focuses on teaching children. Kojen claims to have more than 100,000 students enrolled across Taiwan. You can teach adults or children. Those teaching in the adult department start at $NT580 an hour and those in the children's department start at $NT590 an hour. Where do you look for a job in Taiwan? 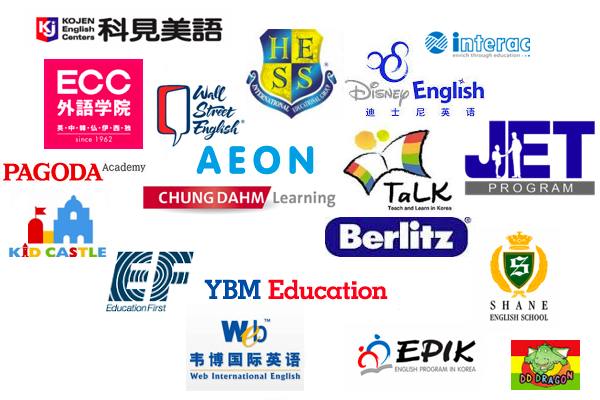 This is a list of some of the biggest ESL teacher employers in Eastern Asia. It's certainly not close to all and this is certainly not a recommendation for any one of these companies or programs. As mentioned before these companies have schools in multiple locations that are run by different people. For example, what happens in one "HESS" language school may not happen in another in a different location. You have to do your research. Your best bet for finding a good school is to inquire with that particular school in person and talk to the teachers there. For more on that I'd recommend watching this video to learn how to find a good job teaching ESL in Asia. However, some of the schools and programs here will not let you do that. You'll have to go through their selection process and be placed where they want to place you. I personally never liked working for the large companies. Mainly because some can be too corporate for my liking. You may have to wear a shirt with the school's logo on it, a suit (common in Japan) or do additional marketing activities. Instead of saying "Welcome to Burger King. May I take your order?" I might have to say, "Welcome to Wall Street English. May I teach you English?" I am not saying that they would make you say that. They hopefully wouldn't, but that branded mindset exists out there. I also found many to be too demanding of your non-teaching time. Many public schools are like that too. You might teach 20-25 hours and spend 15+ hours doing office work. As far as language schools go I tend to prefer the easier going jobs and the smaller mom's and pop's schools. Anyways that's just my point of view be sure to follow the links and read the reviews of schools above.